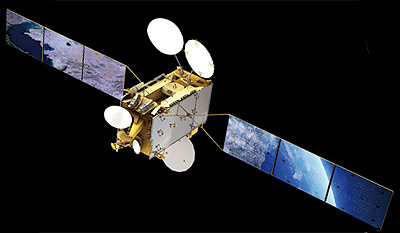 Thales Alenia Space announced it has signed, on 29 September 2009, a contract with the APT Satellite Company Limited, a leading satellite operator in the Asia Pacific Region for the design, manufacture and delivery on ground of a high-capacity telecommunications satellite. The contract also includes Launch Campaign, Training, Launch and Early Operational Phase, In Orbit Tests as well as On Site Support, Dynamic Satellite Simulator, Satellite Control Centre and Baseband Subsystem. APSTAR 7 will provide reliable broadcasting and telecommunications services over the Asia Pacific Region, Africa, Middle East and a part of Europe. Based on Thales Alenia Space’s Spacebus-4000C2 platform, APSTAR 7 is equipped with 28 C-band and 28 Ku-band active transponders. With electrical power of 11.4 kW and payload power of 8.4 kW, the satellite is expected to have a minimum of 15 years lifetime. It was launched in the first quarter of 2012 to replace APStar 2R currently operated at 76.5° East Longitude orbital position. APT Satellite in April 2010 has entered into a satellite procurement contract with satellite contractor Thales Alenia Space France for the manufacturing and delivering of APSTAR 7B Satellite, a Spacebus 4000 C2 Platform with 28 C-band and 23 Ku-band high power geostationary communications satellite. At the same time, APT Satellite also entered into a launch service agreement with launch contractor China Great Wall Industry Corporation for the provision of launch and associated services of the APSTAR 7B Satellite on a CZ-3B/G2 launch vehicle at the Xichang Satellite Launch Center at Xichang in Sichuan Province. The initial launch period of APSTAR 7B Satellite is between 15 July 2012 and 15 October 2012 in the case the launch of APSTAR 7 Satellite is not successful. If Apstar 7 is successfully placed into service, the Apstar 7B contract will be transferred to China Satcom as ZX 12 (ChinaSat 12), a state-owned satellite operator in Beijing, which also needs new capacity but not as quickly as APT. If Apstar 7 is successfully placed into service, the Apstar 7B contract will be transferred to China Satcom as ZX 12 (ChinaSat 12), a state-owned satellite operator in Beijing, which also needs new capacity but not as quickly as APT. Part of it is still be used by APT Satellite Company as Apstar 7. Part of the satellite's payload has been leased to Sri Lanka and is co-branded as SupremeSat 1. The satellite was renamed ZX 15A and moved to the 51.5° East slot until ZX-15 is launched.